It's a quiet, foggy morning here. From my front windows I have a view of the entire San Francisco Bay Area, but this morning it has all disappeared in the fog, and it feels like I am in a ship in the middle of the ocean. Well, except for that tree across the street. It's my first morning with no work, no obligations or places to go, since the latest news first broke. I have spent it going through all the comments people have left here the last few days. I'd read them, but I wanted to take the time to respond to them. I tried to answer questions people had asked, but if all I said was "thank you," those are not empty words I assure you. Later I think I am going to go to the book store and look for a book of poetry by Rainer Maria Rilke. Then I'm going to go to Whole Foods in search of their Curried Vegan Chicken Salad. This is my comfort food. And Michaela, I love you. I have thought over and over what I wanted to say to you about these latest developments. If this bone does indeed belong to Michaela, As my heart instantly told me it does. I feel on one hand, devastated for you that Michaela will never be coming home.. on the other hand I feel a huge sense of peace knowing she was home all along. I guess my greatest hope is that you are able to find the peace you so deserve and are finally able to morn the loss of your beautiful daughter knowing she is at peace. Thank you for sharing such a huge and private part of yourself over the years and most of all thank you for sharing Michaela with the rest of us. Thank you, Shelly. I had that sense of knowing it was Michaela also. When they told me that a child's bone had been found, I felt a lump form in my throat and sink into my heart, and I just felt, "This is it." Since then, of course, I have second guessed myself, thinking maybe it was just an emotional reaction ... knowing myself, that I have had those kinds of emotional reactions in the past. It would be one blessing about finding out, either way, to not have to keep thinking "this is it," because I'd know what it is. I'm always hesitant to say that this is really hard on me, because then people (Rob Lampkin) start trying to hide things from me so I won't have to go through this. It is really hard on me. But it's a part of the journey. You can't reach the end of the road if you skip the journey. And I've walked far enough that my emotional muscles are strong enough to get me through. I can not imagine anything more difficult as a mother than not knowing. You have had an amazing team to work on your case. It didn't surprise me a bit to hear the remains were hand delivered to Arizona. Any truth someone tells you at his point could not be worse than what you have already run through your mind. 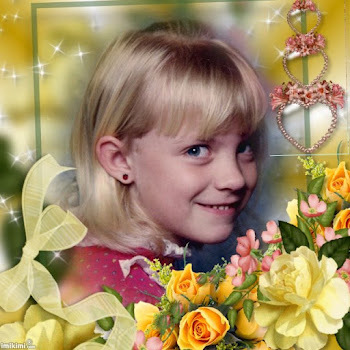 As a reader of your blog I know you feel and experience every scenario you can think of in the hopes of unlocking the key to Michaela's disappearance. Your emotional muscles may be scarred but they are super human and you WILL get through this. I hope that you constantly feel the warmth and love surrounding you from everyone following you along your journey. Enjoy your Sunday I hope the sun has found you! Thanks, and I do feel the love and warmth, and especially for Michaela. The sun is here, but I kind of liked the early morning fog. It kind of muffled the world. Nothing to sat but my thoughts are with you, always Sharon. 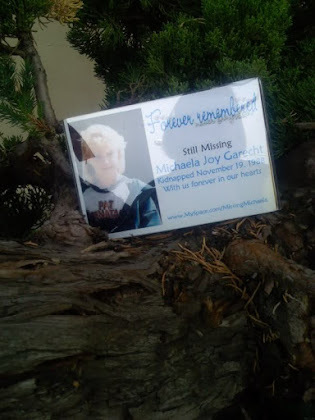 I pray your search for Michaela is nearing it's end, and that if the bone does indeed belong to her, you find some comfort and peace, knowing she has been with angels. Who ever it is, what you have done, going that extra step, will hopefully bring closure and piece to one family. God bless you. You've been on my mind all day long, just remember we're all praying for you and Michaela right now. Sharon- are they absolutely sure this is a child's bone? Whether that bone belongs to Michaela or any other missing person, the fact that the sheriff's office mixed the bones is just unforgivable. It makes me angry that you could have had more answers months ago, and it makes me wonder how much evidence is out there still- for you and for other families. If this is just a fragment, the rest of the bones are obviously out there somewhere. Thank GOD for Mrs. Hobson turning them over for a second opinion. I'll be thinking of you and your family today and always. Sharon, you've been on my mind constantly. I know you'll find some comfort in knowing that Michaela is with your mom if this turns out to be her remains. If that precious little bone belongs to another child I pray for that family as well. You are a wonderful mother and I know whenever the day comes that you are reunited with your sweet girl she will hug your neck and thank you for your endless search for her. Thank you for sharing your heart. And I pray for your heart now as you wait for news. I've been following your blog and Michaela's story for a long time. I just thought I should let you know that you and Michaela are in my thoughts, and I'm hoping that you will at least get the closure that you deserve. I'd hug you if I could. Sharon, I've been reading your blog and that lump you had in your throat - I had it too when I read about that little 3" piece of bone. I too felt the lump sink to my heart. It then sunk to my stomach and I felt sick. Sick for so many reasons. The day Michaela went missing flashed through my mind as though it were yesterday. 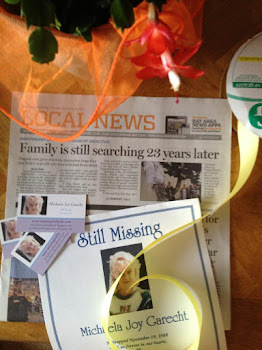 I learned of her disappearance on the evening news. When I heard your name I told my husband, "Hey, I know her." I saw Michaela's face and thought at first you were being applauded for something you had done for the community. I only wish ……..
A second later I realized what had happened and I will never forget the feeling that came over me. It was like everything came to a stop, and suddenly the world seemed like a much bigger and scarier place. Bigger in that I started thinking about all the places where that monster might have taken your little girl. I started looking at maps and the more I looked, the more dread I felt. I wanted to make it all better, Sharon. I wanted to find her and bring her home to your arms. I went to the local school (or church, can't remember which it was now) and helped with flyers but felt it wasn't enough. I'll never forget the day I came to visit you at home. I'd never seen a look in a mother's eyes like the look in your eyes, and I never have since. 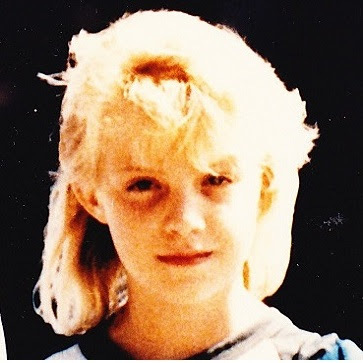 I had never followed a news story as closely as I followed Michaela’s disappearance. My husband was a police officer and I repeatedly asked him why it was taking so long to find her. I felt investigators weren't doing enough or trying hard enough. I wanted them to do more. I wanted them to find Michaela and bring the monster who took her to justice. Days passed, weeks passed, and then months and years. Michaela’s abduction changed the way I viewed the world and the way I raised my children, that's for sure. Abductions were no longer something that happened to some unknown person and that was a harsh reality for many young moms who knew you and your family, and even those who didn’t but who followed your story. I want so badly to give you words of comfort. Over the past few days I've typed hundreds of words only to delete them out of fear I might say something wrong. I’ve decided that at this juncture, I'd rather say what I'm feeling than say nothing at all. You are in my thoughts and prayers. If it is determined that the little piece of bone is not Michaela’s, then I hope and pray with all my heart that she is alive and able to find her way home to you. Sharon, you are by far one of the strongest women I have ever known. I have always been amazed at your ability to put your thoughts into words. I have great respect for who you are and how you've handled extremely tough situations over the years. I may not comment much on your blog but that doesn't mean I don't think about you, pray for you, and care deeply for you and your family. I believe you know that many people love you and Michaela and I hope that brings some comfort. Thank you for sharing Michaela with us. Sharon, you and Michaela are in my thoughts and prayers constantly. I cannot even imagine what you are going through right now, and I remain in awe of your strength. Sending you love, light and oh so many prayers. I remember first hearing about Michaela's case when I was about 12 or 13 years old. My younger sister was about 2 or 3 at the time, as I'm ten years her senior. 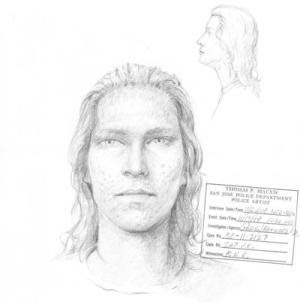 At 26, I was only a baby myself when Michaela went missing but something about her case stuck with me from that day when I first heard about her and the other missing Bay Area girls on the news. Michaela's case always spoke to me. 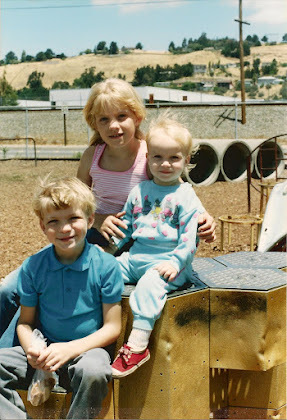 Maybe it was because at the time, my baby sister was blonde and reminded me physically so much of Michaela. When my mom was pregnant with my sister, she knew she wanted an "M" name and I insisted upon Michaela -- I've always loved that name, before I ever knew a thing about your sweet Michaela -- but my sister was born and she became Megan. Still, something about Michaela's case spoke to me. 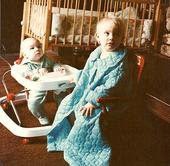 I always saw a lot of my baby sister in her, though she wasn't born until 12 years after Michaela went missing. 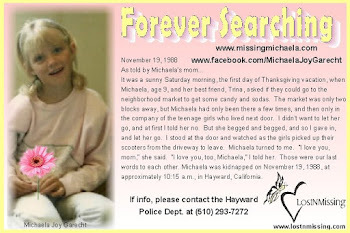 Over the years, I never stopped following Michaela's case. I read your blogs, read your Facebook posts and keep you and your family in my thoughts every single day. I'm a mother now myself to a 15 month old boy and we live across the country from you, down in Florida. Still, my heart is always connected with yours. My thoughts always are with you and your family. Sharon, you are an inspiration to all, and especially to me as a mother. Some women like to call themselves "supermom" if they can clean a house, do some laundry and get to the grocery store all before naptime -- I think you are truly the definition of "supermom." You are an inspiration to all of us parents out there, your heart so full of hope and love. I feel like I truly "know" you and Michaela after following for so long but the truth is, we're strangers. Please know, though, that you're never alone. My heart is always with you. My thoughts are always with you. You are truly an inspiration, Sharon, and I am just hoping for peace and comfort to you as these new developments unfold. I am a mother of two young children and like so many other mothers out there, my heart is with you during this intense period of waiting. Please know that there is a whole world of people out here who you've never met who are hoping and praying for you, for Michaela and for the rest of your family.